Welcome, welcome to the final part of the Make and Cake Tangent here at TWIHM. 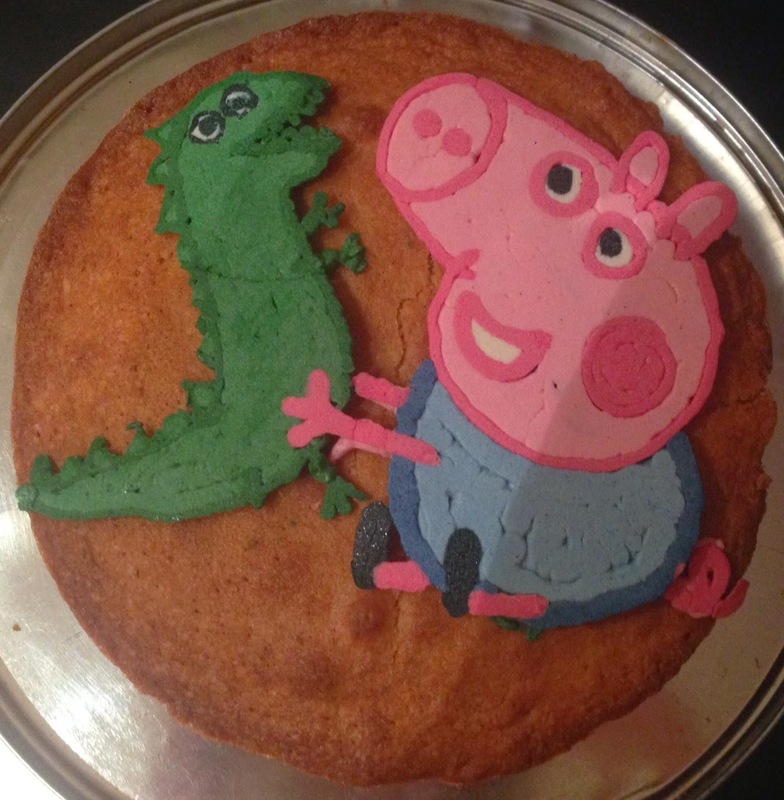 So, we’ve looked at the fear and thrill associated with my amateur dabblings for the Cherub’s birthday cake. Next, for contrast, there was a chat with professional pastry chef,Franzi Thomczik, that went off on some interesting historical meanders. There has been Bakewell Tart to accompany proceedings. Now I’m shuffling along to an organisation called Free Cakes for Kids. Before anyone goes all Daily Mail and huffy (“Oh, the obesity amongst the youth of today exacerbated by the immoral, sugar-plying activities of such groups! ‘Tis the End of Times!! !”) let me note that this is a charitable organisation whose purpose is to make birthday cakes for children who would otherwise not have one. Pause and think about it for a moment. No birthday cake for a child. That’s a pretty huge thing and a desperately poignant absence for a small person. Or even a big person. Think back to your birthdays as a child; I’m sure many of you have some decent and joyful memories of parties, presents and cakes. Oh, the cakes. Often the ones carefully crafted by mothers, fathers, grandmothers and so forth are the most memorable. Why so memorable? Particularly those that may have been a bit wobbly about the edges? Homespun, if you will? Probably because the aforementioned familial maker of the cake loved and cared about – and hopefully still does - the birthday child. Also the makers had the time, the kitchen and enough extra money to bake the cake. Seemingly basic elements that many take for granted. Whereas Free Cakes for Kids helps children who just don’t have some, many or all of those elements that make for a stable family life. 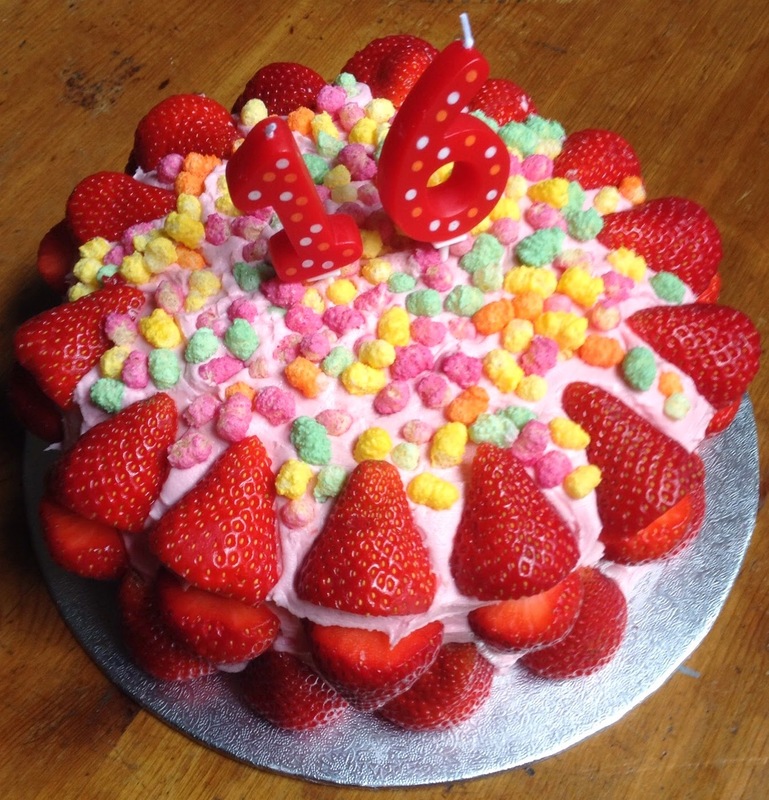 I had a chat with Tessa Lidstone, chum and press officer of FCFK Hackney in London, which provides birthday cakes for some very vulnerable children. Hackney suffers pretty acute levels of poverty. In 2012 Hackney South and Shoreditch came 14th in nationwide a list of child poverty by parliamentary constituency (37% of children) and 20th in the rankings of by local authority (30% of children). If you think I’m indulging in hyperbole here’s that the reference as well as Hackney’s 2013 State of the Borough’s Report on Child Poverty and Family Well-being. The latter states that, although the borough’s child poverty has been decreasing year on year since 2007, it still comes in at number 3 for child poverty amongst all the boroughs of London. So there are a great number of children in the area who could do with the treat of a birthday cake. Members of the FCFK Hackney Committee, with Tessa Lidstone on the far left. But just how do these requests make it to FCFK, never mind to the volunteers to then result into some pretty smashing looking cakes? “We advertise ourselves as a confidential service.” says Tessa. What follows are requests and referrals from a number of institutions, groups and individuals such as schools, childcare centres, domestic violence refuges, the Red Cross or social workers. “Once an organisation has done one referral they find it so easy that they do a lot. We try and find someone who will be the advocate for the family and child, such as a social worker or family support worker.” This advocate is important. Once the cake is made the baker arranges to meet them at a neutral place to hand the cake over. “The baker will very, very rarely come into contact with the child or even the parent. We just make cakes and don’t want to go beyond that with a baker getting involved in a situation or (unintentionally) causing a family to feel in debt. Families don’t want people to know about their situation.” Hence FCFK’s emphasis on confidentiality. Yet once the cake arrives, be it at school, the childcare centre or even at home “… that child for that day is the special one.” Tessa observes. “It’s not just about the cake but it’s about how much fuss people make of the child. As a child it does matter if everyone ignores your birthday.” It doesn’t take much to imagine what all that lovely fuss and attention does for a child living in otherwise difficult circumstances. So does the child ever find out who made their birthday cake? Who helped create the fuss? Which leads on to the question, what’s the appeal of baking for a stranger? Why not buy a cake from a shop? But in this world there’s cake, as in the swiftly cobbled together lemon madeira or muffin variety, and then there CAKE, elaborate and carefully crafted confections that bring extreme pleasure to both makers and recipients. The creations of FCFK Hackney certainly fall into the latter category. But how does the volunteer find out what themes, colours or flavours a child likes? 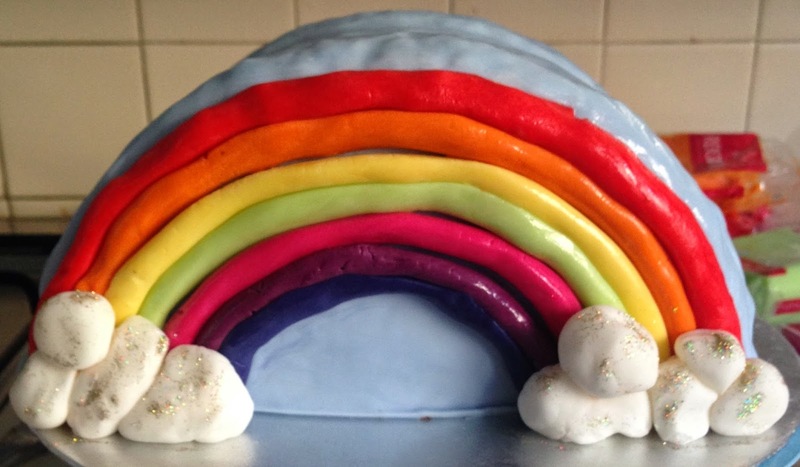 A rainbow cake with an ingenious construction of cumulus clouds from marshmallows. Who wouldn't be happy with that? 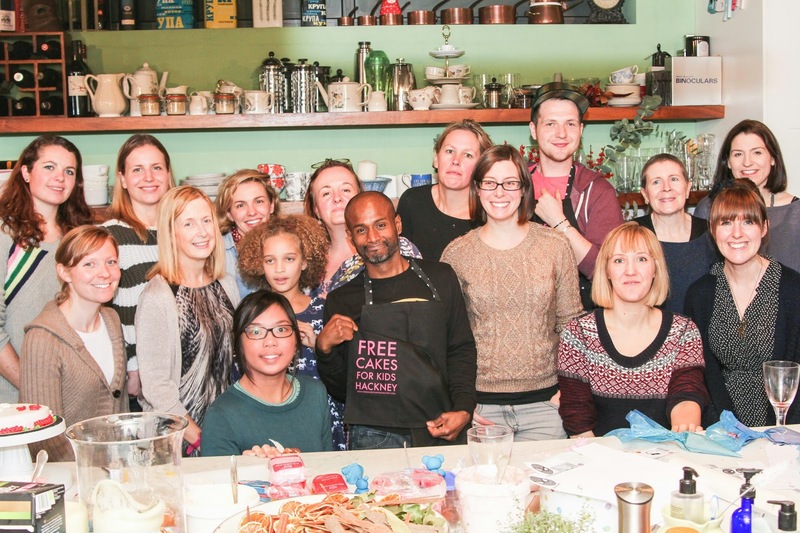 Volunteers at the FCFK Hackney's Christmas baking masterclass. It’s not just the bakers themselves benefiting from such classes. 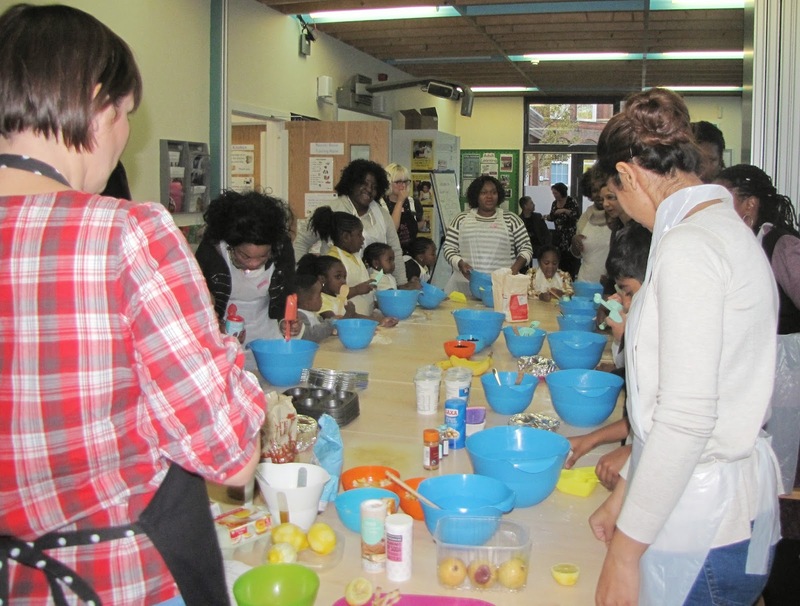 FCFK Hackney started arranging baking workshops with some of the referring organisations, creating opportunities for parents, children and referrers to all make and bake together. There isn’t a formal feedback process from cake recipients to cake bakers. Yet it’s in heartwarming spaces like the workshops, spaces where communities gather to enjoy together the simple act of making, that FCFK Hackney are told just how much their cakes are appreciated. 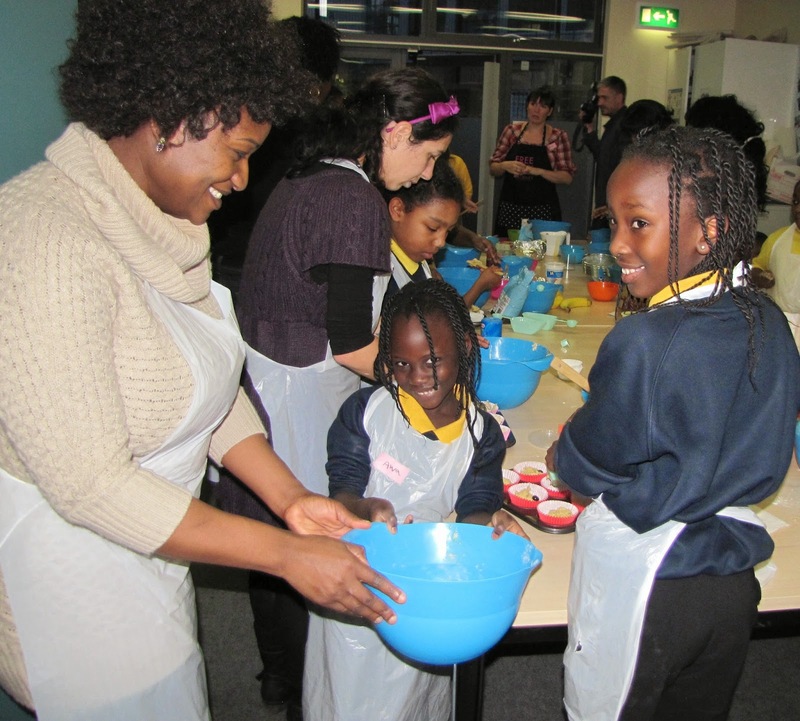 One of FCFK Hackney's baking workshops held in the community. It’s a special thing this whole making and baking malarkey. I can see a PhD needs writing about the power of buttercream as a social bond. As I’ve noted before, ephemeral as these cakes may be, the sheer pleasure the bakers find in making them and the joy the recipients have in receiving them is the stuff of which memories and strong communities are made. And in these difficult times we need as much of that pleasure, joy and hope as we can get. I think the smiles in this picture sum it all up, don't you?